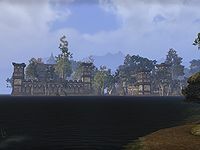 Bravil is a city in southern Cyrodiil, southeast of Castle Bloodmayne. The city is currently inaccessible. There's no bridge across the Larsius River, and attempting to swim will likely result in being eaten by slaughterfish quickly. If one does manage to cross the river without dying, some potion ingredients can be found on the island, but the city itself cannot be entered. There is a gate and a bridge accessing the city from the southern side. Bravil also appeared in Oblivion. Bravil is mentioned in the quests An Affront to Mara and Debts of War.